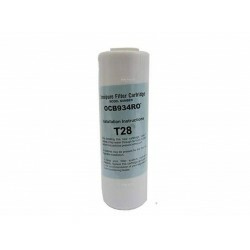 We stock a full range of Xtream Water Filter replacment Cartridges. These systems are usually purchased from Mitre 10, Bunnings or Masters hardware stores. Xstream Twin System Replacement Water Filter Set XSTH14K 10"
Xstream Compatible replacement water filter set to suit: 10" Twin Under Sink Water Filter systems that use a standard housing with screw cap. Compatible with Xstream Under Sink Water Filter Model XSTH14K The kit comes with the following filters: 1 x Sediment Pre Fi..
HydROtwist USA 1 Micron Carbon Block Water Filter XSC1CB 10"
Xstream Compatible Carbon Block XSC1CB The HydROtwist 10" Premium Carbon Block Cartridges are extremely effective at removing unwanted tastes, odours, chemicals and other substances. HydROtwist carbon blocks use fine premium coconut carbon to provide better tasting water. 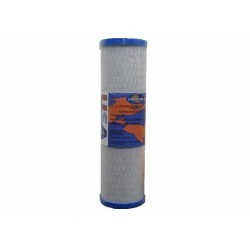 This is a direct re..
HydROtwist USA 1 Micron Carbon Block Water Filter XSC3CB 10"
Xstream Compatible Carbon Block XSC3CB The HydROtwist 10" Premium Carbon Block Cartridges are extremely effective at removing unwanted tastes, odours, chemicals and other substances. HydROtwist carbon blocks use fine premium coconut carbon to provide better tasting water. This is a direct re..
HydROtwist USA 1 Micron Carbon Block Water Filter XSC4CB 10"
Xstream Compatible Carbon Block XSC4CB The HydROtwist 10" Premium Carbon Block Cartridges are extremely effective at removing unwanted tastes, odours, chemicals and other substances. HydROtwist carbon blocks use fine premium coconut carbon to provide better tasting water. This is a direct re..
HydROtwist USA 1 Micron Carbon Block Water Filter XSSH14K 10"
Xstream Compatible Carbon Block XSSH14K The HydROtwist 10" Premium Carbon Block Cartridges are extremely effective at removing unwanted tastes, odours, chemicals and other substances. HydROtwist carbon blocks use fine premium coconut carbon to provide better tasting water. 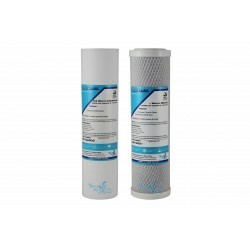 This is a direct r..
HydROtwist USA Granular Carbon Water Filter XSCGAC 10"
Xstream Compatible GAC Granular Activated Carbon XSCGAC The HydROtwist 10" Premium GAC Granular Activated Carbon Cartridges are extremely effective at removing, colour, unwanted tastes, odours and chlorine from your drinking water. 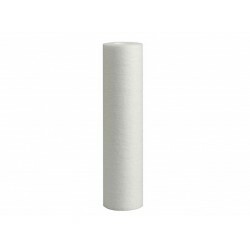 HydROtwist carbon filters use fine premium coconut carbon to pro..
Xstream Sediment Polyspun 0.5 Micron Pre Filter XSC05MBSED 10"
Xstream Compatible Sediment Pre Filter Model XSC05MBSED Used in the Xstream XSTH14K, XSH34-WR or XSH34-W Under Sink Water Filter System This Polyspun Sediment 0.5 Micron Pre Filter is made of quality Polyspun fibre which effectively removes particulate matter from water, such as dirt, sand, ..
Xstream Sediment Polyspun 10 Micron Pre Filter XSC10WSED 10"
Xstream Compatible Sediment Pre Filter Model XSC10WSED Used in the Xstream XSTH14K, XSH34-WR or XSH34-W Under Sink Water Filter System This Polyspun Sediment 10 Micron Pre Filter is made of quality Polyspun fibre which effectively removes particulate matter from water, such as dirt, sand, se..
Xstream Sediment Polyspun 10 Micron Pre Filter XSC25WSED 10"
Xstream Compatible Sediment Pre Filter Model XSC25WSED Used in the Xstream XSTH14K, XSH34-WR or XSH34-W Under Sink Water Filter System This Polyspun Sediment 25 Micron Pre Filter is made of quality Polyspun fibre which effectively removes particulate matter from water, such as dirt, sand, se..
Xstream Sediment Polyspun 5 Micron Pre Filter XSC05WSED 10"
Xstream Compatible Sediment Pre Filter Model XSC05WSED Used in the Xstream XSTH14K, XSH34-WR or XSH34-W Under Sink Water Filter System This Polyspun Sediment 5 Micron Pre Filter is made of quality Polyspun fibre which effectively removes particulate matter from water, such as dirt, sand, sed..